Hungry? A new neighborhood steakhouse and Mediterranean spot has you covered. Located at 2815 S. Shepherd Dr. in Neartown/Montrose, the fresh addition is called Doris Metropolitan. This newcomer--which has other outposts in New Orleans and Santa Ana, Costa Rica--is the latest addition by restaurateur team Itai Ben Eli, Dori Rebi Chia, and Itamar Levy. The restaurant is billed as a steakhouse with elevated takes inspired by the owners' Middle Eastern heritage. It features dry-aged meats "which are offered alongside vegetable-forward appetizers, exotic and local seafood, a thoughtfully sourced caviar menu, and seasonal sides." For starters, look for items like artichoke flower salad with Jerusalem artichokes, tzatziki, and sun-dried tomato; tuna tartare with a ginger emulsion, tobiko, radish, avocado, and soy pearls; and cured fish with remoulade, pickled vegetables, sherry vinegar, and black garlic. Entrees include dishes like veal cheek braised in red wine with root vegetables, polenta, champignons, and pearl onions; and gulf fish with tahini and mushroom salad. Expect to see a wide variety of steak options as well, including a bone-in New York strip, 34 oz. porterhouse, and a 10 oz. Japanese Wagyu strip loin priced at $185. The new addition has garnered rave reviews thus far, with a 4.5-star rating out of 13 reviews on Yelp. 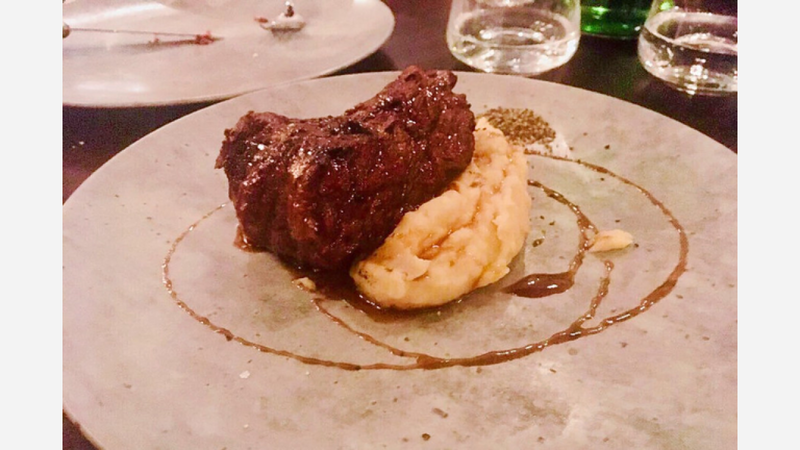 Debbie S., who was among the first Yelpers to review the new spot on December 31st, said: "We had an early New Year's Eve dinner and it was amazing. We had special cocktails before dinner, and then the bread! Oh, the bread: hot onion bread and focaccia and olive/pesto with three flavored butters." Yelper Kim R. added: "Love what they've done to what was formerly known as Triniti! I've been here twice now, once for happy hour & another for dinner. Both great experiences. The staff are polite and professional." And F.A. Y. said: "Great restaurant. We had the porterhouse, the gulf fish, and a few appetizers. All were very good. Great service. It's pricey! Good for special occasions." Swing on by to take a peek for yourself: Doris Metropolitan is open daily from 5pm-11pm.